Faça uma introdução ao centro histórico de Braşov com este passeio a pé de duas horas. Passeie pelo beco mais estreito da Europa Oriental, veja as casas cor de doces da Praça Piata Sfatului e aproxime-se da Igreja de São Nicolau, da Igreja Negra e de outras atrações notáveis. Ao passear, aprenda sobre a história de Braşov - desde a Idade Média até os dias de hoje - e receba a atenção personalizada do guia. Números limitados a 10 participantes nesta excursão para pequenos grupos. A cidade velha de Braşov está repleta de história medieval! Este passeio oferece uma excelente introdução a ele, por isso é ideal para visitantes que querem uma visão geral do que é essa cidade maravilhosa. Super day - Charle (Karoly)was super really local and lots of interesting facts - very informative. Totally recommended for a tour looking at more than the obvious points. Definately do this if you go to Brasov. We met Balazs in the main square in Brasov. He arrived on time. He has excellent knowledge on the history of the town. He made it a great experience. He is a very friendly guy with a great sense of humour. We are facebook friends now! He took us round the church in the town square and the Eastern Orthodox church just outside the town centre which was really interesting. Also went to a Museum of the town and then we walked up to a medieval tower from where we got a great view overlooking the town. He also recommended us some great restaurants and bars to go to within Brasov. Would recommend the tour to everyone especially if they only have a limited amount of time to spend in the town. Our guide, Dan Negoescu, provided considerable information about the history of Romania enhanced with maps and other print material. He walked us thru the old town area as he described its features and the Black Church. He conveyed an appreciation for his country and obviously enjoyed his job. We'd been to Brasov a couple of times before but it is amazing what you don't 'see' without a guide. We were even invited out for drinks by our guide but had booked a visit to see the bears so had to decline. Our guide had also been around during the '89 revolution so we got a real insight into that episode. Would have liked to go into the Black Church but ran out of time. Our guide led us around the old city of Brasov showing us the 'Black Church', 'White Church' Piata Sfatului, Rope Street, Schei Gate and the First Romanian School. Not only did he provide us with lots of information about the features we saw but also he told us so much about the city, economy and politics of the city. He also recommended restaurants that we might try and generally made our visit to Brasov much more comfortable. Our tour was absolutely perfect and made a really good start to our visit to Brasov. I would recommend it to anyone visiting this lovely city. 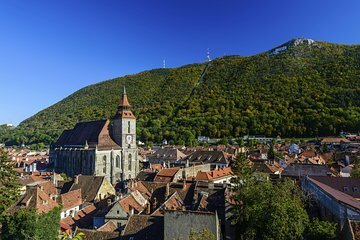 Brasov looks stunning snuggled in the crook of the Carpathian Mountains. The architecture is stunning and it is great in highlighting the similarities and shared history of Europe. The local history is also really interesting. Our guide Andras was great really knowledgeable and friendly. Taught us a lot about the area and the people. He even waited while my girlfriend went shopping.